99.9% of the time this is guaranteed. The resident seal colony haul out on the rocks and islands beneath the mountains every day. The colony currently numbers between 150 and 200 and we usually see at least 70 to 80, often many more. Of course we cannot guarantee how many you will see as they are wild animals. We have seen seals on every day of last season and in operating for 27 years there have only been very few times when we have not seen any. Will I see Dolphins, Whales, Basking Sharks or Puffins? This is unlikely on the trip to Loch Coruisk - we do have sightings occasionally each year but they are very rare. However Dolphins, Whales and Basking Sharks are regularly sighted on our AquaXplore trips in deeper water further offshore around the Small Isles and Puffins nest on the Isle of Canna 15 miles to the west. If you have any questions about the probability of seeing wildlife please do ask. When do you run your trips? Our 2019 season for full scheduled trips (7 days a week) starts on the 1st April and ends on 31st October (weather permitting). When possible we also offer some trips between November and March. Do you sail on Sunday? Yes, Bella Jane sails 7 days a week throughout the season, weather permitting. What are the Regular Boarding Times from Elgol Jetty? At 9.00/9.15am, 10.45am, 12.15pm, 2.00pm and 3.30pm but this is sometimes variable due to low tides. On most days we also offer trips at 8.30am and at 10.00am. We also offer earlier and later trips by arrangement. 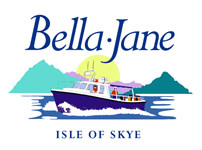 Do you have toilets & refreshments available on the Bella Jane? Yes we have a proper toilet and washroom on the Bella Jane and we serve hot and cold refeshments on the boat too - these are included in your ticket price. We also have some snacks and other drinks available to purchase both on the boat and at our booking office. Yes, our trips are very popular especially during peak season. Many passengers choose to book in advance, to be sure of availability, using our on-line booking form. We now also offer Flexi-tickets to allow you to book and reserve seats without confirming the trip day until nearer the time. Yes, your safety and comfort is of paramount importance to us and so it is sometimes necessary to cancel trips if we feel conditions are unsuitable or unsafe. If you are travelling from far on the day of departure, we suggest you call us for an update on conditions.. If Bella Jane Boat Trips has to cancel your trip we will refund any payment in full or, if you prefer, book you on to another trip when availability allows. If you have made a confirmed booking you will be charged for your booked seats. If circumstances arise where you wish to cancel your booking we will endeavour to resell your tickets but please remember that we cannot guarantee being able to do this, especially if it is only shortly before the trip. Do you do any other trips with more wildlife? 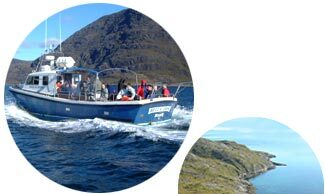 Yes we offer Wildlife and Sightseeing trips on our AquaXplore and Island Cruiser boats to the Small Isles of Canna, Rum, Eigg and Soay. Canna is home to many types of seabirds and, between April and July, Atlantic Puffins. We are fortunate also to have regular sightings of basking sharks, dolphins and minke whales as well as sea and golden eagles. On Rum you can visit the National Nature Reserve and Kinloch Castle, the extravagant Edwardian sandstone mansion as seen on BBC Television's "Restoration" series. All trips include sealife, whale & bird watching.